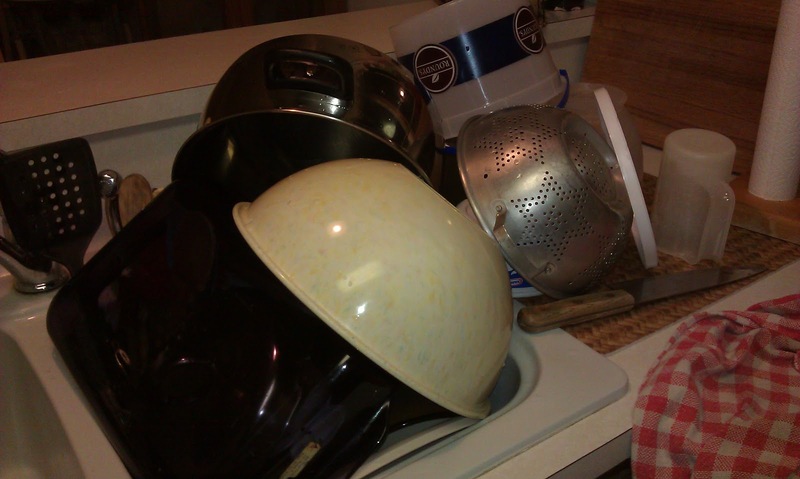 If I'm the only one home, how in the world can there be so many dishes? In one day. Oh yeah - I made bread, cooked the turkey carcass from Thanksgiving, warmed up some chili and made some cornbread for dinner, and there were also dishes in there from breakfast and lunch. They do add up, but I can stack a lot of them in the drainer, because, while I kinda like washing dishes, I do not like drying them. Mostly that's because I have the hardest time actually getting them dry. Seriously, sometimes I can't even seem to get my hands dry when I wash them! It's really irritating. Tomorrow I get to start all over again. I need to make soup with the turkey broth. I'm thinking this Split Pea Soup or maybe Lentil Barley Soup. I guess it depends on what sounds good tomorrow when I'm ready to make it - and if I have all the ingredients. Do I even have split peas or barley? Guess I better check. Tomorrow. When I'm putting all these dishes away, while keeping out the ones I'll be using again. No sense in putting something away just to get it out again!